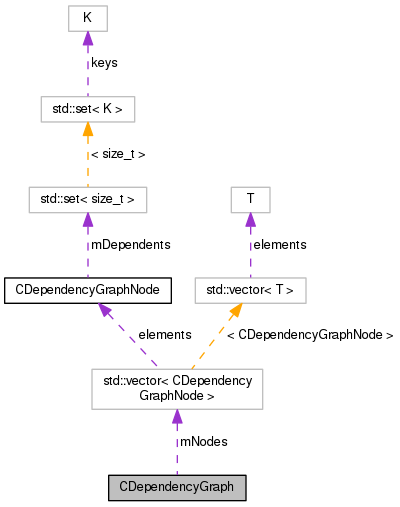 CDependencyGraph describes a dependency graph. Definition at line 74 of file CDependencyGraph.h. Definition at line 52 of file CDependencyGraph.cpp. Definition at line 53 of file CDependencyGraph.cpp. Add a dependent for a particular node. node The number of the node. dependent The number of the dependent node. Definition at line 68 of file CDependencyGraph.cpp. Referenced by CHybridMethodODE45::setupDependencyGraph(), CHybridMethod::setupDependencyGraph(), CHybridMethodLSODA::setupDependencyGraph(), and CStochMethod::setupDependencyGraphAndBalances(). Add a node with a given number. node The number of the node to add. Definition at line 55 of file CDependencyGraph.cpp. Definition at line 86 of file CDependencyGraph.cpp. Retrieve a vector of dependents for a given node. node The number of the node to access. A vector of node numbers. Definition at line 74 of file CDependencyGraph.cpp. Referenced by CHybridMethod::fireReaction(), CHybridMethodLSODA::fireReaction(), CHybridMethod::integrateDeterministicPart(), CHybridMethodLSODA::integrateDeterministicPart(), CHybridMethod::integrateDeterministicPartEuler(), CStochNextReactionMethod::updatePriorityQueue(), and CStochMethod::updateSystemState(). Definition at line 63 of file CDependencyGraph.cpp. Definition at line 102 of file CDependencyGraph.cpp. Definition at line 116 of file CDependencyGraph.h. Referenced by addDependent(), addNode(), clear(), getDependents(), operator<<(), and resize().